This Novel Approach to Childbirth can Make it Infinitely more Bearable. In Praise of Mindful Birthing. So many things went wrong during the birth of my son Leo eight years ago that the obstetrician who delivered him described our experience as being like that scene at the end of “Return of the Jedi,” when the Millennium Falcon just manages to fly out of the Death Star before it explodes. In other words, we made a very narrow escape. That’s the funny story I tell people. The more private one? The sensation I had, for two full days of labor, was of an animal being stalked. I was quite sure the baby or I would die. I alternated between dissociating and panicking by turns, and ultimately, took every drug they threw at me. Though we managed a vaginal birth, it was by a hair’s breadth, and heavily assisted. So when I found myself pregnant seven-and-a-half years later, I was thrilled—but absolutely terrified. I tend to spring into action when faced with anxiety, so I hired an experienced midwife and a team of doulas. My husband and I took a birthing class. I harnessed all the California woo-woo I could muster, one day writing out my worries on a piece of paper that I decorated artistically—and then burned. The next day, I took the ashes to the harbor and threw them in. Unfortunately, none of this really helped. I was a wreck. Then, at 37 weeks, wondering if I should have gone for an elective C-section, a friend gave me the book Mindful Birthing by Nancy Bardacke, a midwife and founding director of the Mindfulness-Based Childbirth and Parenting Program in San Francisco. I’d been meditating on and off for years, but was a bit of a fair-weather Buddhist—I’d never used the practice to get me through a difficult life experience, and I didn’t know whether mindfulness would actually help. When Leo was at school, I’d take the cheerful, yellow book out to the back porch, sink into the rocking chair, and read. My friend had taken a pencil to the margins, and I discovered tiny, elegant checkmarks next to passages she’d found important. Somehow, her impossibly neat, controlled √s calmed me. So did the content. One concept that had eluded me was this notion of finding the space—some call it “the bliss”—between contractions. During my first labor, there was no space. The contractions landed one on top of another, like overlapping lashings. But when Bardacke framed the idea of this space in terms of mindfulness, it began to seem possible. Meditation itself is like a pause between thoughts and moments. And I considered that the main takeaway from my years of being a not-so-great Buddhist was that sometimes you just need to breathe. Could it be that simple? Okay, I thought to myself. I’ll breathe. I felt something inside me open up. Fast forward to week 40: I’m sitting on my back porch on a swelteringly hot day. I had a castor oil smoothie for breakfast, followed by a trip to a delightful sadist of an acupuncturist who made me stumble around her office with my feet full of needles. The doula has arrived, and so has my friend Steph. The candles have been lit. On the stereo, sacred music by Hildegard von Bingen plays. I don’t have time to think about how different this birth is so far, with my candles, my team of women, and my sacred chants, because I’m breathing. I’m having a contraction, in fact. It’s painful, but I don’t think about the next one. I don’t panic waiting for the pause. And…there it goes. I look lazily around the yard. A bumblebee nuzzles the late summer flowers. I can almost see the pollen on its back as it lifts off. A hummingbird stops by. My feet feel hot on the deck. The birthing ball beneath me sways lightly. I am not in pain, I think to myself—not at this moment, anyway. That’s all I did. For nine hours. Of course, the pain got worse; of course, I cried out. I nearly threw up. We chose the absolute worst route to the hospital and I screamed epithets at the guy on his cell phone who nearly made us miss the light. When we arrived and discovered I was fully dilated, I had the misfortune to push for three hours because the baby’s head was asynclitic (tilted to the shoulder). But even during that awful, endless pushing, I just kept breathing, looking for that space. The pain would subside and I’d sink back onto the bed and rest. I did this—over, and over, and over again—and to my great relief, not once did I become that scared animal again. I remained me: an imperfectly strong woman, doing what women have been doing since the beginning of time. At 9:55 p.m., my second son slipped, blissfully, out of me. When I think back on Sammy’s birth, I feel tremendously grateful. I think of what Pema Chödrön says about having the “courage to experience that which is difficult.” I’m still an impatient parent, and when I’m sleep-deprived, I can become a melodramatic mess. But when things get tough, I remember a time when I didn’t dissociate, panic, or medicate away the difficulty. A time when I chose courage instead. The birth of my second son. It gives me hope for other experiences that might come down the pike. And it helps me to know that my son came into this world with a level of openness and stillness that I had never before found. Sometimes, when I remember that, I think to myself that he and I must be destined for very great things. Thanks for the comment, Linda! Interestingly, we used Lamaze for the first labor but either the teacher didn't convey it or I couldn't quite put it all together, because it all flew out the window as soon as the pain started. Oh well. Even good old Lamaze teaches one to breath, its a practice I've used for all kinds of life challenges. 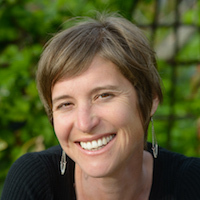 Susie Meserve is a writer, mom, and fair-weather Buddhist living in Northern California with her husband and two young kids. Her work appears in The New York Times Well Family blog, on Elle’s website, in Salon, in Offbeat Home & Life, and in many literary journals. Susie blogs about motherhood and more at More Than a Mother. You can also find her on Twitter and Facebook.